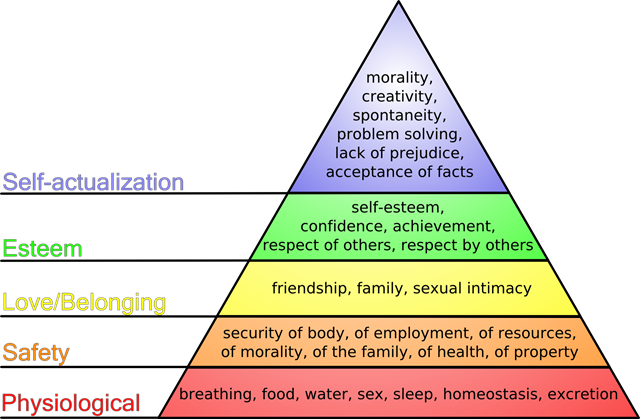 You are here: Home / Staying Sane / Staying Sane: How well do you meet your “Hierarchy of Needs”? Hello, I am a 58 year old going through the pain of the collapse of my 37 year marriage that ended suddenly through no choice of my own. I have been exploring Maslow’s hierarchy of needs. One aspect not mentioned in your summary of Maslow’s heirachy of needs above is that supposedly the needs in the lower levels must be met before those in the upper levels. So at a time of crisis, say after a flood or earthquake, people’s needs become very basic – for food, water and shelter – as they begin to rebuild their lives. At those times they have little need for self-esteem or fulfilling their highest potential by self -actualizing. Gradually as basic needs are met, then they can move onto the higher levels of a safe environment, then companionship. I am learning that the ending of a marriage is similar to such a crisis, especially if it is unexpected and sudden. It rocks the very foundation of your life and threatens everything you ever had; self-esteem, family, companionship, emotional and financial security. You are thrown into a survival mind-set of fulfilling basic needs because everything else is gone. I am finding that it is helping me to actually accept this fact and begin rebuilding my life by starting with those basics needs and ensuring they are met first in a positive way to give myself a strong foundation before tackling those needs higher up – so refocusing first on food (by following a good diet), my health, a safe secure peaceful home environment and, although it’s a little higher up, focussing on my family. After I have healed and become strong at this level I will try to begin to move up the levels and focus on getting my finances back on track and seeking out new friendships, new interests etc, one step (or one level) at a time. That’s my theory anyway. THank you so much for this; and so sorry it has taken me so long to get back to you. In retrospect, you are so right. Thinking back over the past several months, I have found that I’m craving the basic simplicity that you need in life. I am getting LOTS of sleep when I am not with the kids. It is almost frightening how much I can sleep these days. I am also focusing more on food – more than I ever have in the past. I am really rebalancing my diet and finding that I am drawn and crave healthier foods. And this is showing. It is rebuilding me. People are noticing a difference in me and saying so. I feel stronger. And happier. And more energetic. I have been retreating over the past few months and spending a lot of free time by myself. I needed the solitude. I am opening myself up more these days. I am interacting with the neighbors, and finding a true blessing in the community that I have found myself in. I love where I live. And the positive attitude has a spiral affect. It’s getting better for me. I am still not through the entire divorce but I can only imagine how great the full freedom will feel once this part of my life is behind me. I feel for you. And I thank you for taking the time to reach out and connect. I so appreciate this. Please keep in touch. I hope your journey is making you stronger. Thanks for the detailed reply and for sharing more of the background to your situation. Yes, this trauma IS making me stronger in many ways, although it has taken me quite a while to get to that point of admission. I am not quite through it all yet either (the divorce) and am now looking forward to having a ‘clean slate’ from which to begin my new life. Best wishes to you and your journey. Yes, I will keep in touch. You are wonderful – you take what I put out there and take it to the next level. So insightful. Thanks as always and I’m really looking forward to meeting you someday.